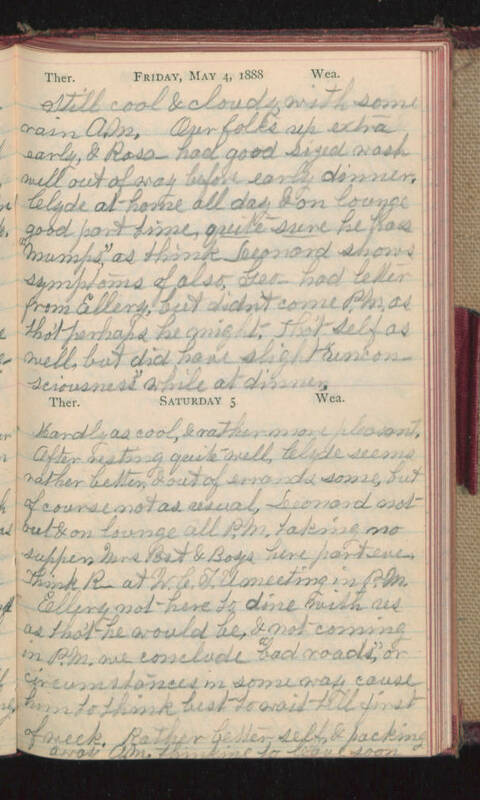 Friday, May 4, 1888 Still cool & cloudy, with some rain A.M. Our folks up extra early, & Rosa- had good sized wash well out of way before early dinner. Clyde at home all day & on lounge good part time, quite sure he has "mumps" as think Leonard shows symptoms of also. Geo- had letter from Ellery, but didn't come P.M. as tho't perhaps he might. Tho't self as well, but did have slight "unconsciousness" while at dinner. Saturday 5 Hardly as cool, & rather more pleasant. After resting quite well, Clyde seems rather better, & out of errands some, but of course not as usual, Leonard not out & on lounge all P.M. taking no supper. Mrs Post & Boys here part eve. Think R- at W.C.T.U. meeting in P.M. Ellery not here to dine with us as tho't he would be, & not coming in P.M. we conclude "bad roads" or circumstances in some way cause him to think best to wait till first of week. Rather better self, & packing away A.M. think me to leave soon.